The best part about being a dad or a parent is that life starts anew—well kinda sorta. You know what I mean! Staring right at you is a clean slate—hoping you'd do right by them, that you'd hold their hands and walk, hold their faces and make deep eye contact, hold their bodies and soothe their every pain. Also if you have a daughter, as a dad you must tie your hair in a pony, once a week. Lipstick is next. Besides partaking in an assortment of daddy shenanigans, being a parent is a never-ending exercise of showing kids the meaning of love. Do I even know what love is? Maybe not, but I do wanna know what love is! And I'm not alone. Until we get to a fuller understanding of love, there's one thing that certainly does the trick over and over—me and the wife working from home, and cooking up a storm for lunch. That's what we did today, after watching and episode of Kara & Nate's New (and old) Delhi Food Experience! We kept on salivating over all the food they were eating and we had to get our hands on some. Sadly, the food at the restaurants isn't as—how shall I say it— invoking of the real deal, so it was us versus the craving! My wife is a huge fan of north Indian style Paneer (semi-soft Indian cottage cheese) dishes, and when she smiled and asked me to maker her some Paneer Butter Masala (a rich and creamy North Indian style tomato and cream based curry, usually whipped up at the Dhabas)—I couldn't turn that face down! I've even made Paneer at home in our New Haven days, and it's simple but it turned out a bit crumbly. For this dish we need soft buttery cubes and not crumbs so I went for the classic block in the frozen section at your local Indian grocery store. I hadn't had a whole lot of time to spend time in the kitchen waltzing my food, but today was different! The twins were at daycare, my toddler (the reason I was working from home as he had a stomach bug) was busy with his activities, and my wife—I ordered her to go turn on a movie while I do my thing. I know, ain't I da bast? This recipe is rewarding in a couple of ways—not only do you get the lowdown on the PBM but also on how to make a basic North-Indian style curry–which by the way guys is fool-proof and so versatile! I'd love to write a long story just on these amazing Dhabas of New Delhi—the real culinary meccas of India, unifying everyone under one modest roof (at times roofless) all in the name of unpretentious and delicious food, but that'll have to wait for another day. I served the Paneer dish with hot Parathas (I admit I resorted to the frozen kind) which are terribly good these days coming out of the freezer. Heck, I couldn't make them any better myself if I tried. They're flaky, they're infused with mint and they're delicious and made by the ubiquitous Haldiram's. And all North-Indian curries remain incomplete without a zesty and simple onion salad—topped off with a tangy Chaat Masala and a squeeze of lime, a perfect compliment to the luxurious silky curry and soft bread. 1. Boil (around 10 cups) of water in a large pot. Once the water comes to a rolling boil place the tomatoes in the pot and blanch for a minute or till the skin starts peeling off. Carefully remove the tomatoes from the pot and set aside to cool down. Discard the water. 2. Once the tomatoes are cool enough to handle, peel the skin off and transfer to a food processor or blender, along with half an onion. No need to chop anything. Add the garlic and ginger if using fresh to the food processor at this time. Puree everything extremely well, making sure you're getting a fine puree. 3. Heat a large, heavy-bottom pan with 1 tbsp of ghee on medium heat. Once the ghee has melted and the pan feels hot, add the tomato, onion, and ginger-garlic puree to the pan. 4. At this point the puree needs to be cooked down to a pasty reduction of all the concentrated flavors, about 30 minutes, stirring occasionally, ensuring the sauce doen't stick to the bottom. At the end of the process, the paste should feel lumpy and swirl around then pan as you rotate it, having released the cooking fats. The consistency of the paste should resemble the tomato paste that comes out of a tube or a can. 5. Add all of the spices to the mix—coriander powder, turmeric powder, garam masala, red chili powder, cardamom pods and the salt. Toast the spices till fragrant—30 to 45 seconds. 6. Add the heavy cream and milk, and incorporate well. Cook for 3 to 4 minutes till everything feels well incorporated. 7. Gently crush the Kasoori Methi in the palm of your hands to break down the stems of the dried herb and add to the sauce. 8. Add 2 tbsp of cubed butter, and incorporate, once incorporated, add cubes of fresh Paneer to the sauce. Reduce heat to low and cook for an additional 2 minutes or till the Paneer has softened up. 9. When ready, transfer the Paneer Butter Masala into a large bowl and splash it with a dash of cream and some Kasoori Methi. 10. For the onion salad, combine all ingredients into a bowl and mix well. Let sit for 10 minutes. 10. 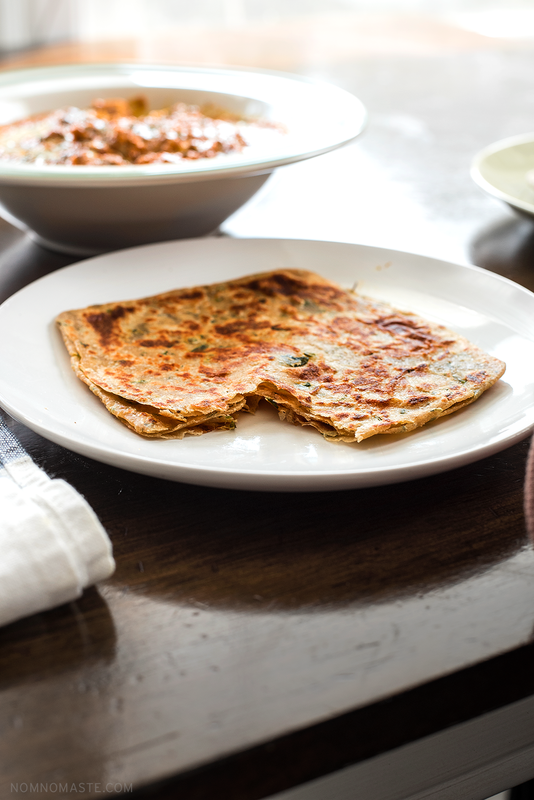 Serve with hot parathas and onion salad. Sign up to receive recipes and updates.